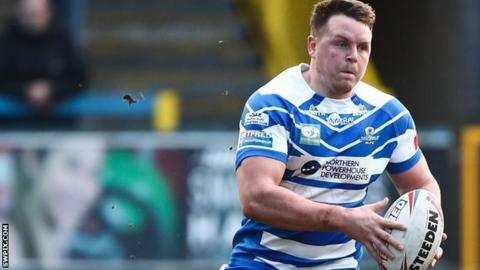 Halifax upset Super League side London Broncos as they ran in four tries to reach the Challenge Cup sixth round. Ed Barber, Ben Kaye, Reece Chapman Smith and Quentin Laulu-Togagae all went over for the Championship side. Halifax's Steve Tyrer added eight points with the boot as the hosts led for most of the tie. A try by Mark Ioane and two from Jacob Ogden, plus two goals by Morgan Smith, could not save the Super League outfit from defeat, however. It is the second successive season that the Broncos have exited the competition at the fifth round stage while Halifax reach the next stage for the first time since 2017. Barber gave Halifax an early lead with Tyrer converting but London hit back with Ioane's try as Morgan Smith kicked them level. Barber's try, converted by Tyrer, restored the hosts' lead before half-time, only for Ogden to score a try that Smith converted. Halifax edged ahead again through Chapman-Smith and Tyrer's boot before Laulu-Togagae broke from inside his own half to extend the lead, with Tyrer maintaining his 100 per cent conversion rate. Ogden's second try gave the Broncos hope but Smith missed the kick, and Ogden was then denied a hat-trick when he was adjudged to be in touch. Halifax: Laulu-Togagae, Robinson, Tyrer, White, Fleming, Kaye, Barber, Larroyer, Kavanagh, Saltonstall, Woodburn-Hall, Chapman-Smith, Calcott. Interchanges: Kidd, Morris, Davies, Cooper. London Broncos: Hellewell, Kear, Pelissier, Lovell, Pitts, Richards, Gee, Fleming, Mason, Morgan, Meadows, Ogden, Smith. Interchanges: Abdull, Cunningham, Battye, Ioane.